Is Europe on the road to ruin, due to increased auto ownership? To what extent? As traditional neighborhood architects would say, Europe has “good bones.” That is, most European communities are extremely fortunate in comparison to most American communities in the sense that they were largely built before the emergence of the ruinous shift to “car craze” travel patterns. As a result, these European communities were built for transit, walking and bicycling. That is, their traditional, in-town areas are compact, mixed-use (residential mixed w/ non-residential), multi-story, and modest in the provision of surface parking and street size. This explains why these European communities remain such fantastic places (that millions of non-Europeans love to visit as tourists). They were built using timeless principles — principles that will never go out of style. The design was intended to make people happy, instead of cars. What this all means is that increased auto ownership in Europe is troublesome but not necessarily fatal to what they have. 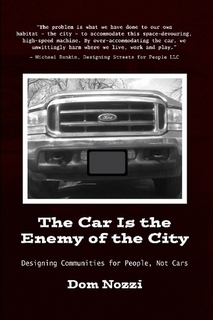 In their urban areas, car ownership will be obligated to struggle to fit in. For the foreseeable future, it will remain inconvenient and costly to own and use a car in these European places. The danger is that European leaders may incrementally allow suburbanizing, car-friendly changes to the design of their communities—if they do not have sufficient pride in what they have, or leadership. The obstacles to undesirable suburbanization there is that it may be cost-prohibitive to retrofit the space-intensive needs of cars in communities that are now modest in size. Can the US learn any lessons from European cities, which have within walking distance everything Americans in most cities must drive to reach? The lessons that can be learned in the US are that traditional community design patterns that we have largely abandoned and forgotten about since approximately WWII are timeless. They remain wonderful, envied places centuries after they were first built. Those traditional principles—mixed use, higher density, walkable compactness, multiple stories, modest parking and street sizes—are an essential component for all communities. They must remain a lifestyle choice in all communities—a choice that is rapidly vanishing in the US. There will always be citizens who wish to enjoy the merits of the traditional, sociable lifestyle. And in the future, the number of citizens who seek such a lifestyle will grow as the auto-dependent lifestyle becomes increasingly unsustainable, unaffordable, and unrewarding. When I mention to friends in the US that I live quite comfortably (in Barcelona) without a personal car, there is a stunned amazement. Any thoughts on the reasons? Roughly since WWII, Americans have built their communities to make cars happy. Among other things, this has led to a substantial number of citizens fleeing the downwardly spiraling quality of life in town (due to the fact that car-friendly design almost inevitably worsens the quality of life for people). They flee due to the decline in quality of life and the fact that they were now able to do so because travel by car means that jobs and other daily needs no longer need to be close to each other. The result of the growing irrelevancy of distance is that we have low-density land use dispersal. Most homes are now quite remote from all daily destinations: work, retail, culture, entertainment, civic, etc. It should therefore not at all surprise us that we find ourselves forced to make nearly all trips by car. The dispersal locks us into extreme car dependency. It naturally seems impossible to nearly all of us that life could be at all possible without continuous access to a car (or someone who can give us a ride). Most of the Baby Boom and more recent generations have never experienced life in a place that is not designed for car dependency. We have lost the cultural memory of the tradition we have left—a tradition rich in travel choices. Sadly, it is now nearly impossible to lead a fulfilling live life in America without a car. Too many sacrifices need to be made. Loss of independence. Loss of time. Loss of ability to go to certain places, buy certain things, or work in certain places. Without a car in America today, one is looked upon as a weirdo. A bizarre anachronism. But as Paul Bedford, the Toronto planning director, has pointed out, the sign of a quality city is that it is possible to live an enjoyable life without owning a car.